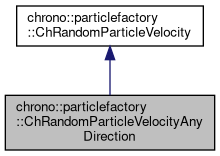 Generator of random particle velocities with any direction. Modulus is constant by default, too, but it can be set as randomized via a statistical distribution. Set the statistical distribution for the modulus of velocities. Set the modulus of velocities as a constant value. Function that creates a random velocity each time it is called.